"There is a tremor at first. Then, what follows is so powerful and massive that the pressure it releases cracks a giant land mass and momentarily jars a continent from its anchor!" From "Toxl The World Killer", Weird Mystery Tales #2. An explosion so awesome in its scope that it is entirely without sound. That is the impact Jack Kirby had on comics. I don't think any collection of words can really speak to Jack's work with anything resembling adequacy. 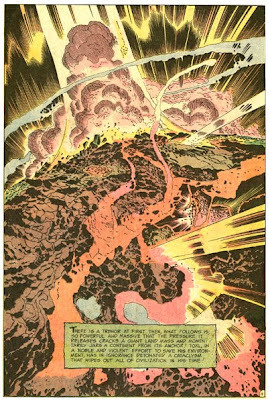 Even Mark Evanier's Kirby: King of Comics (while an incredible tome) doesn't do justice to Jack's body of work. I think Tom Spurgeon has the right idea: the only way you can really celebrate Jack is to just showcase his work.